I just compare the two devices in conceptual view of interface/interaction design; innovative or progressive, or futuristic or current suggestion. The first device is a conceptual MP3 player, Iriver. The second one is 5mega HSDPA phone K850i, Sony Erricson. In the Iriver, when it was published, some people criticize that the Mp3 player seems not to be practical to bring it even though it has a space in its interface to equip an AAA battery and a user can put it on a desk, turning its body. They say that the design concept is too radical to understand. Might be.. hmm. Other say that if design is creating activity fully depend on users so the users place emphasis on sense/emotion rather than practical use, It is reasonable that designers can create the kinds of the conceptual design. Also might be.. The conceptual design is controversial right now but I think it is an inevitable way in designing. On the other hand, in the K850i phone, we can view Sony Erricson is gradually changing the design intension of the phone. In general, most of mobile phones have an input mode, the 5 way navigation on its physical interface to interact with the interface in its screen. 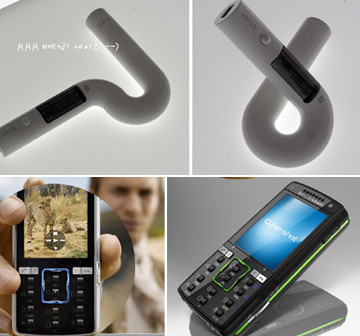 In this phone, they suggest the concept, D-pad, the green line navigation, encompassing 2 and 5 key. The D-pad might not be useful right now because of new usability problems occurred by new design concepts. However, even though their design concept of the phone doesn’t result in positive feedback from public, they suggest a new concept, publish, and then compensate gradually the problem of the interface/interaction of phone. They are continuing to apply experimental ideas and strengthening its demerits. That is the way Sony Erricson is taking to design. If you are professional designers in HCI field, which way do you want to take? How do you lead users in Radical or progressive way?